Born Damon Darron Jones on the 25th August 1976 in Galveston, Texas USA, he is a former basketball player, who played in ten NBA teams, including the Miami Heat, Cleveland Cavaliers, Vancouver Grizzlies during his career, and after he retired he focused on a coaching career; since 2014, he has been the shooting consultant for the Cleveland Cavaliers. Have you ever wondered how rich Damon Jones is, as of mid- 2016? 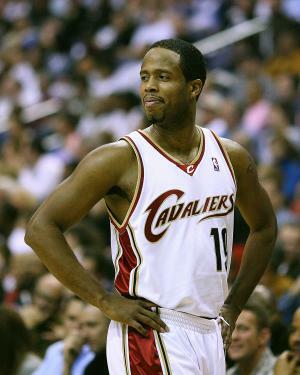 According to authoritative sources, it has been estimated that Damon Jones` net worth is as high as $10 million, an amount he has earned through his successful career as a basketball player and coach. Damon picked up basketball in high school, and never dropped it from his hands. He went to Ball High School, where he was a player with the Golden Tornadoes basketball team. Following his matriculation, Damon enrolled at the University of Houston, majoring in sociology, but where he continued playing basketball. and before he obtained his diploma, Damon entered the 1997 NBA Draft; however, he was left undrafted. Nevertheless, his career began that year, as he signed a contract with the Black Hills Posse of the IBA, and stayed there for one year. After that, he was a player with the Jacksonville Barracudas for a short time, and then signed with Idaho Stampede of the CBA for the 1998-1999 season. His first engagement in the NBA came in 1999, when he was signed by New Jersey Nets, however that didn`t last long, as he changed teams three times in 1999 – Boston Celtics, Golden State Warriors and Dallas Mavericks, for which he played until 2000. Through to 2005 he shifted five clubs – Vancouver Grizzlies, Detroit Pistons, Sacramento Kings, Milwaukee Bucks and Miami Heat. Damon signed a contract with the Heat worth $2.5 million over one year, which certainly increased his net worth to a large degree. He played in 82 games, and averaged 11.6 points per game, which was his career best, and also played in 15 play-off games, in which he averaged 12.1 points. After Miami, Damon signed a contract with the Cleveland Cavaliers worth $16.1 million over four years, increasing further his net worth. However, his numbers dropped drastically while in Cleveland, as he averaged only 6.5 points over three seasons, before he was traded to the Milwaukee Bucks. After 18 games played, the Bucks released Damon, and he signed with the Piratas de Quebradillas, a basketball club based in Quebradillas, Puerto Rico, which competes in the Puerto Rico Basketball League, but he was released after only a month and four games, in which he averaged 10.7 points per game. After Puerto Rico, Damon moved to Turkey and the Aliağa Petkim basketball club, however, he didn`t pass the medical, and the deal folded. He didn`t want to retire just yet, and spent a few months playing for the NBA Development League club the Reno Bighorns, after which he retired as a player. Two years after retirement, Damon became the shooting consultant for the Cleveland Cavaliers, a position he still holds. As a part of the Cavaliers, he became the NBA Champion, when LeBron James and the rest of the team won the championship ring in 2016. Regarding his personal life, Damon Jones has a child with WNBA star Tina Thompson, however, details of their relationship are undisclosed in the media. Other aspects of his life are unknown in the media, however, he is active on popular social networks, including Facebook and Twitter.